Garage door spring repair Brentwood CA is one of the premier services we are particularly proud to offer to our customers. Don’t be tempted to hire a general handyman for this repair or do it yourself. 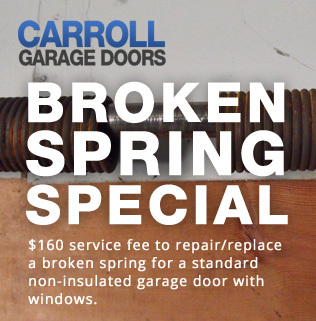 With our promotional rates for broken springs and our fast, efficient service, you’ll find that professional repair from Carroll Garage Doors is a much better approach. In some ways, worn garage door springs are just as big a concern as broken springs. If you try to use your garage door opener when a spring has broken, you risk burning out your garage door opener motor. You might even find that your garage door spring problems have made it impossible to open the garage door. Needless to say, getting stuck with a malfunctioning garage door is extremely inconvenient. You can greatly reduce your risks of a spring breaking on you by getting regular inspections from Carroll Garage Doors. An annual inspection will improve your chances of identifying and replacing worn springs before they snap. Springs aren’t the only thing we look at in an inspection. We also inspect safety sensors, opener motors, cables, and all the other moving parts of your garage door.